Something that most brands aren’t using in their marketing is humour. Some brands don’t know they can use it. Others motivate their choice of not using it with the explanation that they’re too conservative for it to work. The truth is that no matter what type of business you are, humour works. Because humans love to laugh! No matter if it’s Dorothy, 95 years old, or your conservative boss. Succeeding in making your audience laugh leaves a long-lasting impression that will be tremendously beneficial for your brand. Social media is a great place to use humour. It’s a relaxed place where most of its users are looking to be entertained. Give entertainment and a good laughter to your audience and your audience will love you for it. In this article, we’re digging deep into the world of humour, what it can do for brands (both positive and negative), how you can use it in an appropriate way on social media, and finally discuss 5 reasons you should implement it into your own social marketing strategy. If you look percentage wise, very few companies are using humour in their marketing. Luckily for you, that’s a good thing! The most common reason we hear is that “it’s too risky” or “it doesn’t suit our brand”. Humour is a scary thing for many brands, and for most, an undiscovered way of portraying your brand that is unknown and scary. In fact, almost everything that is unknown is scary. Humour for brands in marketing is just like anything that has been controversial in society in the past. Yes, humour is far from as controversial as it once was, and even less controversial from a society point of view. According to me, most of the controversy comes from within the brands and has a lot to do with brand and industry culture. If a brand within a particular industry that isn’t known for using humour, uses it, it will take a lot of courage and hard work to break the patterns that have existed for such a long time. In these cases, most of the antagonism will come from within your very own brand, and most often from people who have been within the industry for a long time. But when you finally break the patterns and do it in the right way, beautiful things can come out of it. Yes, many brands are actually using humour today. 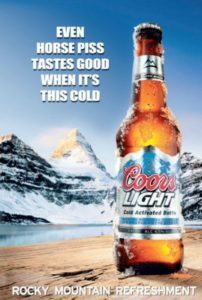 Take the Snickers commercials, Skittles commercials, Coors Light commercials, for example. They have been huge successes! I promise you; in the future, we’ll see more and more brands implementing humour in their marketing strategies. We’ve already seen the pre-humour revolution where the number of brands using humour has increased dramatically. However, I personally believe that we’ll see a lot more of it in the future. Another big reason that brands choose to stay away from humour is that it comes at a risk. Therefore, it’s important that you never cross any lines and are very careful with what it is you are joking about. There’s a fine balance between fun and obnoxious, and in order for a social campaign that leans on humour, to work, you must be highly certain that the positive effects outweigh the negative. Why should you use humour? But not very surprising, I am assuming? Just put yourself in your own shoes. If you meet a new person and share lots of laughs together on the first encountering, aren’t you going to go away from there, thinking “that’s a really nice person”. If you share laughs together, you’ll have an easier time trusting them, because you’ll feel like you’ve known them longer. Exactly the same principle applies for marketing and building trust with your audience. And that’s exactly what humour does. You won’t instantly gain more trust because you share a joke on social media. The trust is earned by with that joke showing that there’s a real person behind that message, that laughs, smiles, and cries, just like themselves. In short, it helps humanize your brand. And when you have a humanised brand that go deeper than your fancy logo and brand name, that’s when you’ll be able to build the trust that really matter to brands. Why is trust so important for brands? I’ve said it many times before, but I think it’s so important that it’s worth mentioning again. If people don’t trust you, they’ll never buy from you. Would you buy bread from a shady bakery that you don’t trust? Of course not! Because you have no idea what’s in it. The bread is a metaphor for what’s really inside a brand. If your audience doesn’t know the personality of the people inside of your brand, they’ll have a harder time building any trust with you, and that’s the beauty about humour; it helps you build just that. As we’ve touched upon, relatively speaking, only a small share of businesses dare to try their luck with using humour in their social media efforts. For you, that’s a good thing! That means you’ll have an easier time standing out. However, it is important that you act quickly! The humour scene for brands is quickly growing in popularity and when it becomes saturated (as it will one day), it will be harder for you to gain traction with your piece of humour content. Many brands take themselves too seriously, and as a result, their advertising tends to come off as stiff and impersonal. If you just avoid the things that can make your humour efforts backlash, you’ll gain an edge over your competitors, as most brands aren’t taking advantage of humour in their marketing. When you make your audience laugh, and share comedy content on social media, you automatically make yourself more approachable. Just think about yourself as the person who is always making everyone laugh, and that everyone wants to be around. People always want to be around the person who is kind and checking up on people to make sure everyone is happy. And if you make your brand that person, you’ll automatically attract more people. It is proven that humor ” humanizes your voice and evokes a “feel good” response”, and people prefer to buy from companies that provide them with just that. 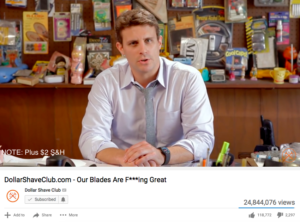 Just look at Dollar Shave Club. When they first started, they were going against marketing giants like Gillette and Wilkinson’s. Their only leverage was humour. In their “debut” YouTube video, they went all in on humour, and created a video that resonated perfectly with their target audience’s sense of humour. The result? Over 24 million YouTube views! That’s a ton of exposure! In fact, creating humanistic videos on YouTube has helped them gain ground in the tough industry of razors, and has now been sold to Unilever for $1B dollars. Tell us a lot about the power of a laugh. Sure, the video gained them a ton of exposure, but it is what happens next that shows the true power of humanistic marketing content. You know it by the name of word of mouth marketing. The bottom line is that content that have good punch lines tend to be shared and discussed far more than regular content – both on and offline. And we all know how powerful word of mouth marketing is, don’t we? The best part is that it is most often done peer-to-peer, which means that the brand recommendation (if such takes place) will be far more trusted. In fact, 92% of people trust peer recommendations. To show just how powerful it is, let’s go through it quickly. 74% of consumers identify word-of-mouth as a key influencer in their purchasing decision. 91% of B2B buyers are influenced by word-of-mouth when making their buying decision. Word-of-mouth has been shown to improve marketing effectiveness by up to 54%. Humour is a powerful thing. It’s something that all humans love, no matter age, gender, background, or income. What differentiates is what people call humour, and consider as fun. Implement humour in your social media marketing and you’ll soon notice that you’ll become more approachable.